1. What does the MTA WA do? We are the voice of the Western Australian motor industry. The Association is a member-based organisation run by members, for members. We champion industry issues on behalf of our members who individually would not be heard by government. Please contact our Membership Team on (08) 9233 9800 or email [email protected]. 3. What do I get from being a member of the MTA WA? An MTA WA membership entitles you to the most comprehensive suite of business development and management tools available, that empower you and your business and strengthen the skills of your staff. Dedicated Industry Specialists (Divisional Managers) who understands how the motor industry works and whom can provide industry specific mentoring. On-demand Industrial Relations Experts who can provide advice, information and representation for employment matters relating to specific businesses. Exclusive Member Alerts, keeping you compliant with updates on legislation changes, regulations, wages, entitlements, compliance issues etc, and the latest in industry news. Access to Staff Training, certification courses and post-trade accreditations to maximise skills and productivity. All-new, tailored Industry Events to learn industry skills, build business networks, meet and socialise with other members, and promote member businesses. Member Discounts, from inventory discounts to merchant tools and more. Green Stamp Audits, OHS Audits (based on Worksafe plan), and assistance and advice on legislation from our Green Stamp and OSH consultants. 4. I have a problem with the automotive business I have been dealing with, can you help me? If you have a consumer issue or a dispute with an MTA WA member you should in the first instance, contact Consumer Protection - which is a division of the Department of Mines, Industry Regulation and Safety. 5. What is my username and password to log in to the website? Your username is your email address that you have supplied to the MTA WA when you joined as a member. If you have recently changed your email address, or would like to add additional users, please contact the membership department on 9233 9800 to change your details. We do not keep any records of any passwords. If you have forgotten your password, please click on FORGOT PASSWORD and follow the prompts to reset your password. 6. How do I know if I have a log in? 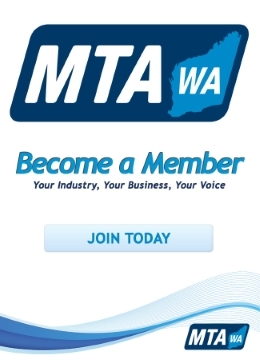 If you or the business you work for are a member of the MTA WA, you will have a login. If you are unsure whether you are a member or not, please contact the membership team on 08 9233 9800. 7. How do I find the Engine Room Blog? You can access the Engine Room E-News from our website home page, by clicking “View All News”. Alternatively, click here to be taken to our news page. Make sure you subscribe to our fortnightly newsletter to keep up to date with the latest industry news. Click here and tick the newsletter box at the bottom of the screen. 8. Help! I can't find the awards and wage schedules. Employment and Industrial Relations advice is a benefit that MTA WA members receive. To access the Employment and Industrial Relations advice, please ensure you are an MTA WA member and are logged in. Once you are logged in, click on the “Employer HR & IR Support” tab at the top of the page. You can then navigate to either State or Federal Wages Schedules at the bottom of the page. 9. How do I register for an industry event? You can see the full list of upcoming events on our “Events Calendar” page. You can get here by clicking the link on the website home page. Click on the event that you are interested in to find out more information. You can register and pay online for MTA WA Member Events. Once you are on the event page, please fill out your details and click on REGISTER. MTA WA Members receive discounts for events, so make sure you are logged in to access any member discounts (Refer to point 5 & 6 if you are unsure how to log in). 10. I am an MTA WA member and I would like to display the MTA WA Member Logo in my business. As a member we encourage you to display that you are an MTA WA member. You can download the MTA WA Member logo here and use it on your business’ signage, displayed on your website, or placed on your letterhead and office stationery. We have a limited number of MTA WA Member stickers available to post out to members. Please contact our Membership Team on (08) 9233 9800 if you would like an MTA WA member sticker posted out.